Starting at midnight on May 3rd 2016 our region will come together for one BIG Day of Giving – a 24 hour online giving challenge that lifts up lives and makes this the place we call home. In its third year, the BIG Day of Giving has raised nearly $9 million for nonprofits serving our region. Last year our region raised over $5.6M and engaged over 23,000 donors in one day of giving! For the very first time, The Center for Violence-Free Relationships will participate in this exciting regional event involving more than 600 local nonprofit organizations. The BIG Day of Giving, coined BIGDoG2016, is an online networking and giving event that provides nonprofits with the opportunity to gain exposure and start relationships with new donors. 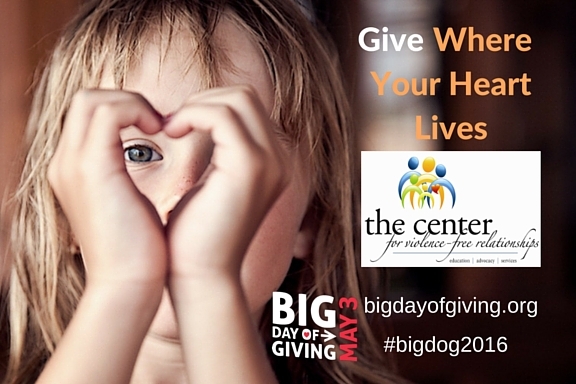 We hope you’ll mark your calendars and join us beginning at midnight, May 3rd and contribute to The Center for Violence-Free Relationships by making a donation of $25 or more using a credit or debit card on the bigdayofgiving.org website. Stay tuned for more information that we’d love for you to share with your family and friends! Tell them why you support The Center and ask them to join you in lifting up lives and giving where your heart lives! Find out more about the BIG Day of Giving at their website bigdayofgiving.org, or on The Center’s website at www.TheCenterNow.org. ← Are You Man Enough?